Delivery, specialist fruit trees and soft fruits - Chris Bowers and Sons. Fast despatch - we aim to despatch all orders within 3-5 working days, and often sooner! Please refer to the Growing Guides section of our website for planting and aftercare. If you have any questions pertaining to your trees and how to grow them please just ask for expert advise. Are you open to personal callers? No, the Nursery offers an online ‘mail order’ service and regrets it cannot accept visitors. We have a flat rate carriage charge which is £8.95 on all orders. Is that carriage charge per item? I see you offer discounts for bigger quantities. Can I mix the varieties to take advantage of the cheaper price? 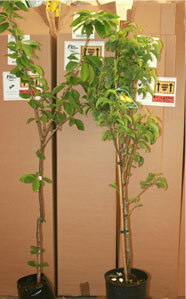 No, the larger quantity rates are for the same variety, individual trees and bushes will be charged at the each price. Can you send your stocks abroad and how much does it cost? Yes, we can send to any European country within the EEC. We cannot send to countries outside of the EEC. The carriage charge for any order outside of the UK is £30, a one off charge applied to the total order regardless of size. Channel Islands and Southern Ireland are also included in this charge. Are your stocks supplied in pots? They are sent out in containers during the Summer months. From Autumn to Spring they are supplied bare-root. Each method is the best for the time of year concerned. The exception is Grapes, Blueberry and Blackberry – these are always in containers regardless of the time of year. Sometimes the containers may be removed for safer transportation. You can plant at any time and we despatch more or less all year round. Often the Winter months are viewed as the ‘best’ time by experts but if you want to plant during the growing season/Summer that’s fine as long as you are able to water them well afterwards until they are established. Yes, all stock is guaranteed to arrive in good condition. It is guaranteed to grow during the first growing season and it is guaranteed true to name thereafter. How big are the trees you sell? A loaded and complex question but one we are asked frequently! We have such a wide range of differing trees the size on despatch varies A LOT. But as a rough guide, dwarfing rootstock trees may be around 36+” in length. More vigorous stocks are usually a little bigger than that. Soft fruit bushes are normally 2 years old with 2-4 stems. Trees offered as suitable for fan/espalier are lower branched trees. Can you offer mature/older trees? No because the perceived advantages of planting older stock is outweighed by the disadvantages. We send out younger stock because it establishes more quickly and easily. Older trees receive more of a shock after transplanting and tend to ‘sit’ for a while doing nothing, by which time the younger tree has raced ahead. How can I check stock availability? Our website reflects current availability and is updated constantly. Basically, if you can order it online it should be in stock and will be sent out more or less straight away. How long will I have to wait for an order? We send out all orders within two to three working days, sometimes sooner so you should receive your items in less than a week. Can I defer delivery to a time that suits me? Yes; when you get to the checkout there is a ‘delivery instructions’ section where you can tell us which week you would like it delivered, or any other instructions. You can order in advance and tell us what you would like us to do. We can’t agree to deliver on a specific day, but a specific week is ok.
Do you sell posts and tree guards? No we sell only the trees and bushes, not sundries. Will I have to sign for my delivery and be in when it arrives? No. You can leave instructions on your online order for the parcel to be left in a safe place of your choosing and this will be put on the parcel. You can also have it delivered to a place of work or a neighbour, if preferred and there are facilities for a different delivery address online. How soon will my fruit trees crop after I have received them? It does depend on the type of tree you order and local conditions as well. Dwarfing trees are more precocious & despite being smaller on receipt will usually be quicker to come into bearing; sometimes you might get the odd fruit the season following planting, normally it is one to two years. More vigorous trees take a little longer to fruit, 2-3 years is a good average. Remember this is a guided estimate only, we can’t guarantee how soon your trees will fruit. My trees have arrived but it’s frosty or snowy. What should I do? As long as the soil is still workable then you can plant them. Frost or snow won’t harm them once they are in the ground. If you can’t deal with them straight away, they will keep for several days as they are if you place the package in a cold shed or garage. They must not be kept near any form of heating and you must check to make sure the roots do not get dry; soak them in a bucket of water if need be. After that if you still can’t plant, the roots can be set in big buckets of damp peat or compost and placed outside in a sheltered position. Or they can be ‘trenched in’ to the garden in their bundles, making sure all the roots are covered with wet earth. Planting of bare root stock has to be completed before the buds burst in the Spring.